Registration is open to all for the qualification. go to our site and send us an e-mail with your name. The end of registration is 21 January! THE SERVER CALLED "NML 2015" protect by password "dyna". All matchs will be play in random maps. !The date and all times of the matches of the tournament will be announced no later than January 22! (if we reach more than 18 players we proceed with DEATMATCH otherwise we’ll formed teams). *In case of equality of the last place we proceed with a DUEL match: wins and qualifies the first player who scores 3 points, while the others are eliminated. We create 6 teams of 3 players randomly selected of 18. The battle starts, DIVIDED INTO 3 DAYS. The battle take place with a TEAM DEATHMATCH with TIME LIMIT of 20 minutes*. *In case of equal, wins the team with the player who has the most points. In case of further parity, comparing the scores of the second players, and so on, if necessary. The three matchs are drawn to go to the semifinals. The team that stays out of the draw goes automatically in final. Now, clash the team remained outside the previous draw and the winner team of the semifinal. 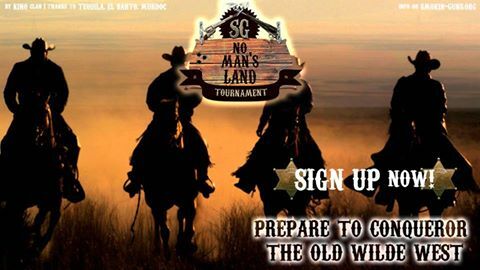 On the same day, after TEAM DEATHMATCH, the winning team can fight in NO MAN'S LAND! to decide the tournament champion. The match take place between all members of the team with a DUEL MATCH and win the player who scores the first 7 points. At the matchs is allowed to attend as spectator to the players of the teams eliminated in the last two days. In case of absence of one or two players of a team, exceeded the time of the match, the only representative of team can decide if to play or retire, declaring winning the opposing team with the last choice. In the total absence of a team, exceeded the time of the match, the opponent team wins. In the absence of both teams during the day of the match the new date to retrieve it will be announced later, on the Smokin' Guns 's forum. •it invades a match which does not have the right to participate. Last edited by Alex_zonE on Mon Jan 05, 2015 1:50 pm, edited 7 times in total. Last edited by Alex_zonE on Mon Jan 05, 2015 1:49 pm, edited 1 time in total. I'm sorry i can't take place :/ Have to do very much for university.